Race and color barriers are still issues that affect the overall well-being and advancement of women of color in the millennium. Join Dr. Culbreth and guests, Professor Samii Kennedy Benson, Professor Charish Halliburton and Dr. Lata Murti for a thought-provoking discussion on race and color barriers that attempt to stagnate the well-being and advancement of women of color. Topics include racism, colorism, white privilege, white superiority, occupational sabotage, lack of respect, interracial and interracial diversity, the problem with tolerance, education, inequality, on being marginalized, invisibility, disparate treatment, film, media and music industries, intimidation, standards of beauty, among a plethora of topics. 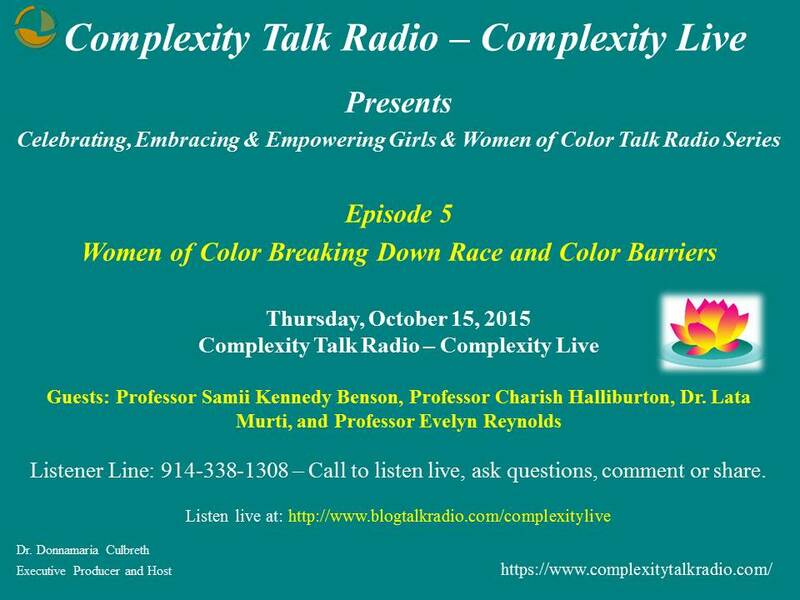 The highlight of the show will be our esteemed guests’ recommendations and strategies for breaking down race and color barriers.